Dark Horse Books, 9781506700496, 144pp. Fan-favorite creators Gail Simone (Batgirl, Deadpool) and J. Calafiore (Secret Six, Exiles) return to the city whose citizens are hunted, not by villains, but by heroes! 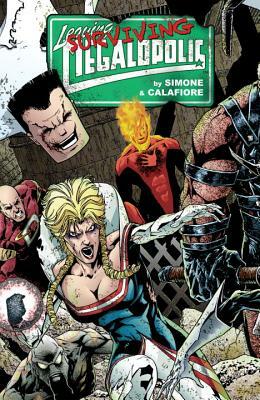 The survivors of Leaving Megalopolis reluctantly return to the doomed city still under the control of formerly beloved superheroes, now turned brutal killers on a rescue mission straight into the heart of madness! Get in on the ground floor of this critically acclaimed series, and see what happens when the good guys go very, very bad. Collects issues 1-6 of the nail-biting series. Gail Simone is an American writer of comic books. Best known for penning DC's Birds of Prey, her other notable works include Secret Six, Welcome to Tranquility, The All-New Atom, and Deadpool. In 2007 she took over Wonder Woman. In 2011 she became the writer for Batgirl as well as co-writer for The Fury of Firestorm. She became the writer for the Red Sonja series in 2013 with Dynamite Entertainment as well as Conan Red Sonja for Dark Horse Comics in 2015.